Kicking off in May 2018, we handpicked an agency each month to work their magic and produce a cover image for the monthly magazine. There's now one week left to vote so make sure you get your votes in now. Each cover reflects the edition's investigative feature and who better to enlist for the challenge than some of the nation's top agencies. We've tackled some big issues throughout the year, from diversity in the industry to data privacy and more - with each cover often dividing opinion. 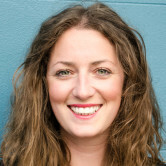 Agencies including CHE Proximity, The Monkeys, The Royals, 72andSunny, Saatchi & Saatchi, Colenso BBDO in New Zealand and R/GA were given briefs that challenged their teams, but ultimately showed the abundance of talent in our thriving creative industry. The winner of the AdNews Cover of 2018 will receive a specially made bespoke AdNews ‘A’ trophy and the cover will feature in an exhibition of work at the AdNews Agency of the Year in April 2019. 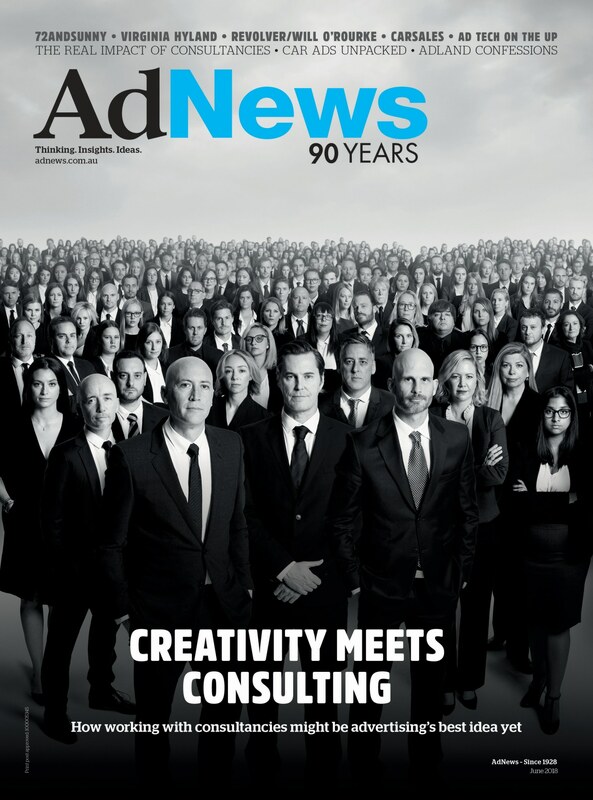 See: AdNews Agency of the Year reborn: A new era for industry awards. We want your votes and in case you missed any, we have the full 2018 wrap below. AdNews Agency of the year 2017, Che Proximity, created a cover for our investigation into social media metrics. It chose one of the greatest conspiracies, the moon landing, and added social media giants such as Mark Zuckerberg and Jack Dorsey in the background, filming on their mobile phones. CEO Chris Howatson said they wanted to represent the idea that each social media giant was ‘making their own truth’. The team shot the image in one day and spent a week in retouching to convert the cardboard cutouts into real people. The first to take on the challenge of designing our cover in 2018, CHE set the bar high. Organising a rabble of Monkeys in suits was impressive. In June we looked into how how consultancies are shaping the industry and there was no better agency to take on the task than The Monkeys, which itself had been acquired by consultancy firm Accenture the year prior. Chief creative officer and co-founder Scott Nowell said they wanted to make the point while having a bit of fun at their own expense. Nick Cummins said his team was already having discussions about the benefits and dangers of brands having access to data so they were excited to work on the brief. “We wanted something that made people feel something about the topic. So, we decided to create a cover that reflected society’s fears about data privacy.” The innocence of a young girl sharing her most private thoughts and experiences in the form of her diary with faceless corporates had the drama that more than hits the mark. 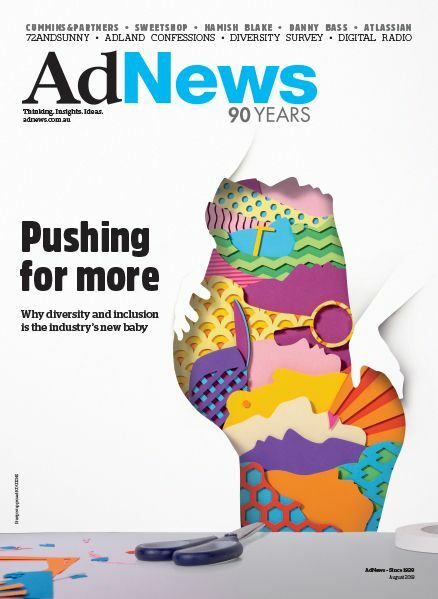 Diversity has been a big issue across the media industry for years and adland hasn’t been left out of the discussion. We enlisted the help of 72andSunny to deliver the right cover. Senior designer Thanh Lu said they wanted the cover to be positive, vibrant and fun because “that’s what you get when you build a team of unique individuals” like those at the agency. Lu said it was fun to go old-school for the cover. Using old school tools the team used layered and cut–out paper to create the patterns and shapes - with a bit of Photoshop magic. Impressively it was all done without a single paper cut wound inflicted. We called on Saatchi & Saatchi to create our issue on ‘Power 50 and Top 30 Emerging Leaders’, where we looked at those that shape the industry and those that are on their way to the top. The agency had double the workload with our reverse-flip cover. Conveying both concepts of Power 50 and Top 30 Emerging Leaders on one front cover was not the easiest brief, so when CEO, Anthony Gregorio, was quick to suggest a flip cover, it was a no–brainer. The ‘shirts’ concept was selected because it was simple, engaging and challenged the perceptions between the old guards and the new through a simply visual device most could relate to. 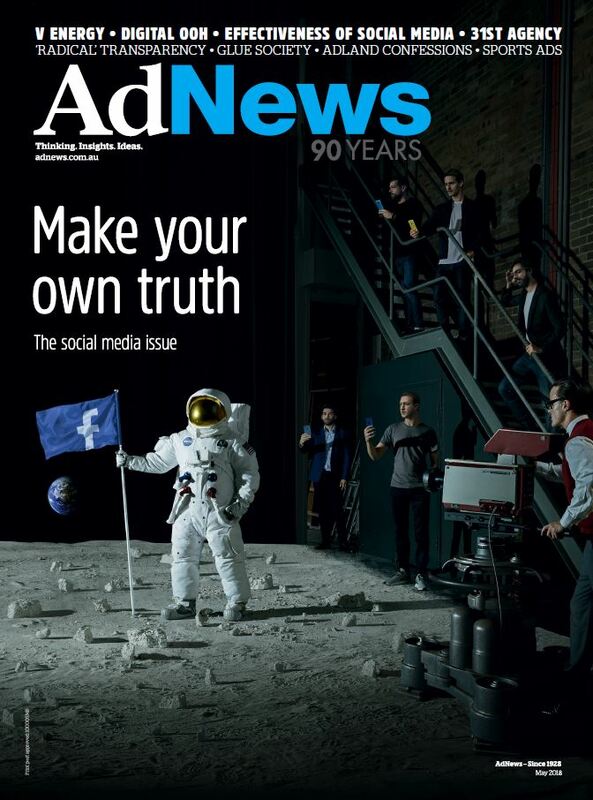 We went across the Tasman to create a special New Zealand edition of AdNews. 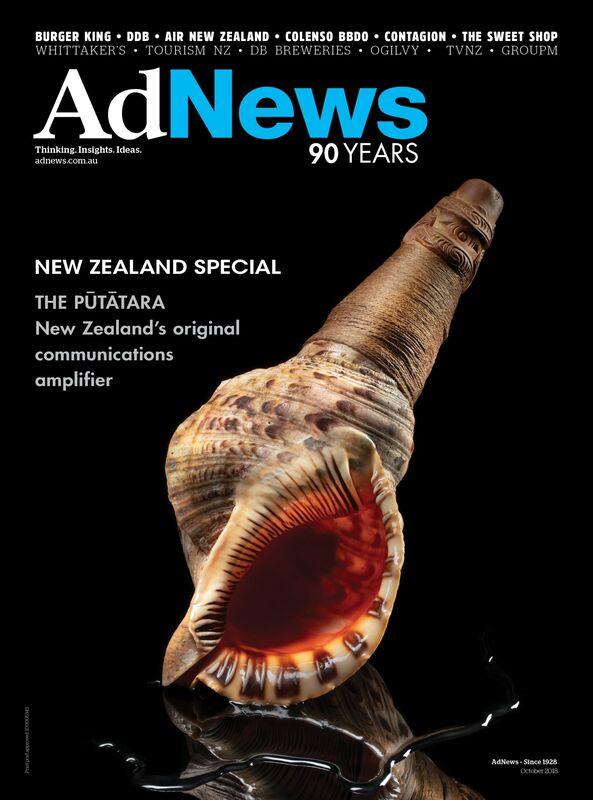 Auckland-based Colenso BBDO created this striking image of a putãtara, the “original communications amplifier in New Zealand.” The team at Colenso looked at the past, present and future ways of communication in New Zealand and decided the putãtara was the perfect representation of this. Used by the Mãori people of New Zealand to communicate over long distances it’s a nod to the heritage, culture, and creativity of the nation. The putãtara reflects a relationship between Mãori and Pãkehã, demonstrating a contrast of traditional forms of announcements/calling people’s attention to news and modernity. 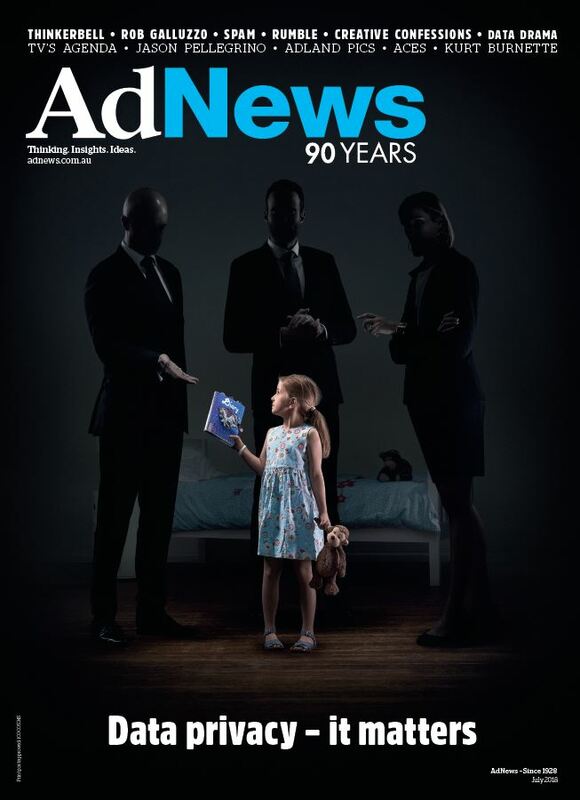 This end of year 2018 edition is extra special as it celebrates 90 years of AdNews. Our bold and provocative cover was created by R/GA. 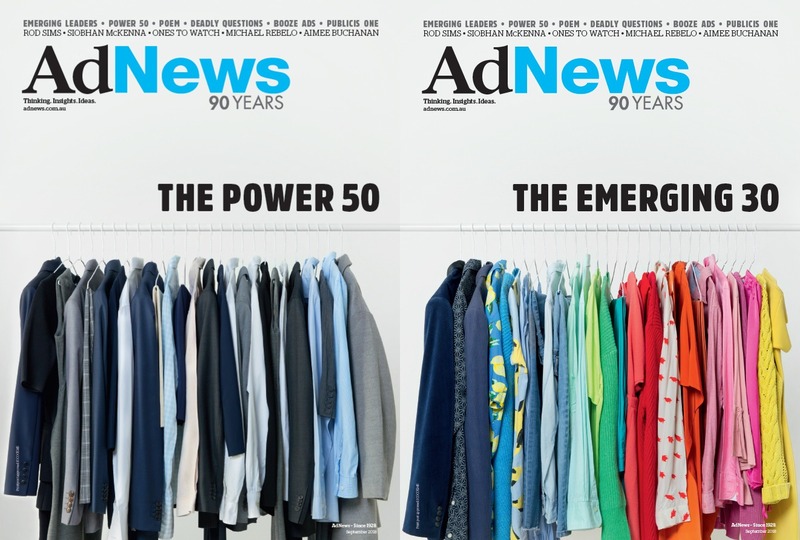 The irony of asking a digital agency to create the front cover of a 90-year-old anniversary edition for AdNews was not lost on us. It’s not AI and robots that will become of the utmost importance to the advertising landscape in the next 90 years, it’s bigger and deeper than that — it’s us as people, as commodities, as products ourselves.